1) This paper is a Malaysian Peer Review paper, which will be presented at FIG Congress 2014 16-21 June, in Kuala Lumpur, Malaysia. The leading agency in Malaysia on Cadastral Survey, the Department of Survey and Mapping Malaysia (JUPEM) has experienced a need to move from a single purpose cadastre to a multipurpose cadastre (MPC) environment. A pilot study was conducted at the Federal Territory (FT) Putrajaya. This paper highlights the main component of the pilot study which is the FT Putrajaya MPC database development and basics of 3D city model generated from the 3D point-cloud data acquired through Mobile Terrestrial Laser Scanning (MTLS) technology. A general requirement for setting up an MPC database for Malaysia has been established in this study and it was concluded that the FT Putrajaya MPC Database and its 3D city model have the potential as a spatial enablement to the government, private sectors, and society in general based on the spatial accuracy achieved in this study. As the leading agency in Malaysia on Cadastral Survey, the Department of Survey and Mapping Malaysia (JUPEM) is responsible to further modernize the cadastral system in Peninsular Malaysia. Changes have been made technically, operationally, structurally and institutionally in Malaysia’s cadastral survey system from time to time to ensure the Department’s relevancy in serving the society. The motivations for these changes are mainly due to the requirement for increased service provision and efficiency, and the larger needs of clients and governments. As public expectation relating to land delivery system increases, the need to move from a single purpose cadastre (its main focus is on the issuance of Titles) to a multipurpose cadastre (MPC) environment seemed significant to meet the demands. Thus, in its bid to understand the MPC concept and its implementation, a pilot study was conducted by the Department under the 10th Malaysian Development Plan at the Federal Territory (FT) Putrajaya. This paper highlights the main component of the pilot study which is the FT Putrajaya MPC database development and basics of 3D city model generated from the 3D point-cloud data acquired through Mobile Terrestrial Laser Scanning (MTLS) technology. A general requirement for setting up an MPC database for Malaysia has been established in this study and it was concluded that the FT Putrajaya MPC Database and its 3D city model have the potential as a spatial enablement to the government, private sectors, and society in general based on the spatial accuracy achieved in this study. As the leading agency in Malaysia on Cadastral Survey, the Department of Survey and Mapping Malaysia (JUPEM) is responsible to further modernize the cadastral system in Peninsular Malaysia. Changes have been made technically, operationally, structurally and institutionally in Malaysia’s cadastral survey system from time to time to ensure the Department’s relevancy in serving the society. The motivations for these changes are mainly due to the requirement for increased service provision and efficiency, and the larger needs of clients and governments. As public expectation relating to land delivery system increases, the need to move from a single purpose cadastre (its main focus is on the issuance of Titles) to a multipurpose cadastre (MPC) environment seemed significant to meet the demands. Thus, in its bid to understand the MPC concept and its implementation, a pilot study was conducted by the Department under the 10th Malaysian Development Plan at the Federal Territory (FT) Putrajaya. This paper highlights the main component of the pilot study which is the FT Putrajaya MPC database development and basics of 3D city model generated from the 3D point-cloud data acquired through Mobile Terrestrial Laser Scanning (MTLS) technology. The MPC database is developed by optimising various geospatial dataset to create large scale GIS basemaps. Such geospatial dataset is available within the Department i.e. enhanced FT Putrajaya’s National Digital Cadastral Database (NDCBD), Strata Database including scheme footprint (PDUSSM), GIS Layer Management System Database (GLMS), Large Scale Mapping data, Orthophoto image, LiDAR image, Utility information and levelling or geodetic features, besides additional data collected via 3D Mobile Terrestrial Laser Scanning (MTLS) to acquire Point Cloud Data. Furthermore, State Geospatial Data Center (SGDC) dataset available at the Malaysian Centre for Geospatial Data Infrastructure (MaCGDI) for FT Putrajaya area were also acquired and integrated with the MPC Database. The SGDC dataset consists of various data categories namely; Built Environment, Transportation, Demarcation, Topography, Vegetation, Hypsography, Hydrography and Utility. Horizontal accuracy was determined using Ground Truth GPS survey at selected and proven NDCDB boundary mark. Pre-marking of NDCDB boundary marks were made at selected locations that can be identified through geoferenced point clouds. 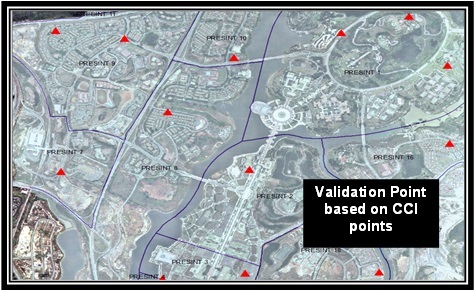 Vertical accuracy was determined using Bench Mark based on National Geodetic Vertical Datum (NGVD) as validation points. Pre-marking of bench mark/temporary bench marks were made at selected locations that can be identified through geoferenced point clouds. GDM2000 is applied as a reference system for MPC database. Coordinate transformation from GDM2000 to Cassini and RSO Geocentric is executed using certified transformation paramater acquired from JUPEM. Pre determined Cassini Geocentric and RSO Geocentric Coordinate ground proofing were carried out using GPS survey. Analysis of the results indicates the quality of the coordinate system. Temporal accuracy aims at describing the discrepency between the actual date of capturing the data and the date as recorded in the metadata of the dataset. This reflects the currentness of the data. Thematic accuracy concerns the accuracy of attribute values. The metrics used to describe thematic accuracy depend on the measurement scale of the attributes, whether they are measured in nominal scale, ordinal scale, interval scale or ratio scale. Describe the completeness of geographical features over space, time, theme and scale. A dataset is consistent when contradictions are absent. Most important is topological consistency. Level of Detail (LoD), is related to how much information is documented to maintain interactivity of the 3D City model. 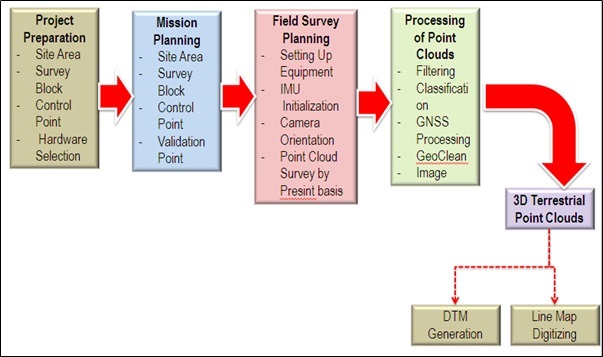 Additional 3D geospatial features data collection has been carried out using Mobile Terrestrial Laser Scanning (MTLS) technology (see Figure 1). The immediate output of MTLS is 3D point cloud represented by points in a 3D coordinates system (x,y,h). 3D point clouds from MTLS produces geospatial information that comprise of building footprint, road, utility (lamp post, fire hydrant, electrical post and etc. ), lake, tree and other features in scanning window. 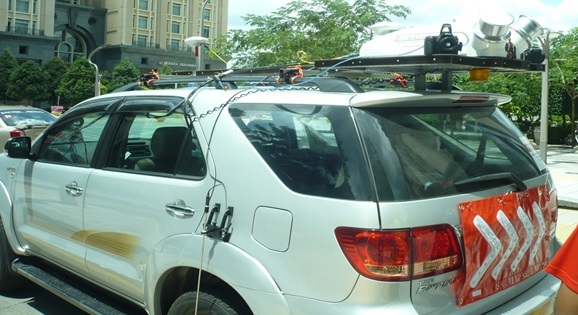 MTLS is an emerging technology that combines the use of a laser scanner(s), the Global Navigation Satellite Systems (GNSS), and an Inertial Measurement Unit (IMU) on a terrestrial mobile platform to produce accurate and precise geospatial data. The data is initially processed using post-processed kinematic GNSS procedures. The GNSS solution is then combined with the IMU information to produce geospatial data in the form of a point cloud. This point cloud is then adjusted to well defined points throughout the project area to produce the final geospatial values. The MTLS data at 95% confidence level (1s) is good to +- 5 cm for the horizontal and +- 7cm for vertical. The adopted methdology for MTLS data acquisition is shown in Figure 2. The methdology comprises of the following 5 phases of activities: i) Project Preparation; ii) Mission Planning; iii) Field Survey Planning; iv) Processing of Point Clouds; and v) Processed 3D Point Clouds. A Geodetic Datum Transformation System (MTRANS) Version 4.1 software has been used to transform all the point clouds to GDM2000 datum reference system and projected to Cassini GDM2000. Vertical reference system was based on National Geodetic Vertical Datum (NGVD) and the vertical components is derived by reducing the ellipsoidal height to Mean Sea Level (MSL) height using MyGeoid and local levelling bench marks. For future usage, raw data in the Mobile Terrestial Laser Scanner is kept in universal WGS84 format. The data is exported to NEH format (.pts) via QINsY data export. The file is then converted to a personal geodatabase (.mdb) via Microsoft Access. This format is later converted to shape file. Multiple shapefile is then imported into geodatabase (.gdb). The final step is to convert the coordinate system to GDM2000 Coordinate System via the MPC Application Module. The adopted processing methdology for the collected MPC MTLS data is shown in Figure 5. In the data processing methodology, the point cloud obtained from the MTLS is appropriately cleaned. Noise and spikes from the laser scanning is removed using either Qloud or Pointools. The cleaned data is then converted to POD format. With Trimble Sketchup, the POD file is then used to digitize the building outline. This is followed by meshing and texturing the wire frame. Photos are georeferenced and point cloud coloured. 3D models will then be digitized using Trimble Sketchup. The amount of details digitized will depend on requirement. The models produced will then be exported to ArcGIS. The cleaned data is also checked and compared to Control Points. Corrections will be applied if error is minor. Data will be recollected if error is large. Point cloud will be regenerated with applied correction. ArcGIS Geolocation and Quality Control is then done on the 3D Model and Point Cloud. This is imported into the MPC geodatabase. Due to the MTLS limitation, the top part of the buildings in FT Putrajaya were not scanned. Hence additional data provided by LiDAR and high resolution satellite images were utilized to fill-up the gaps (roof top images) in the 3D City modelling. All the geospatial dataset acquired in this study were processed using the MPC Application Module which has been developed to enable integration of multiple data sources, validation of MPC database and updating new spatial features. The main objective of the module is to produce seamless geospatial data. The module has three (3) main tasks, i.e., Data Conversion, Data Entry and Data Migration. It is developed based on a desktop-based GIS development environment to extend GIS functionality, customize and automate repetitive operations, and integrate ArcGIS version 10 with VBA functionality. 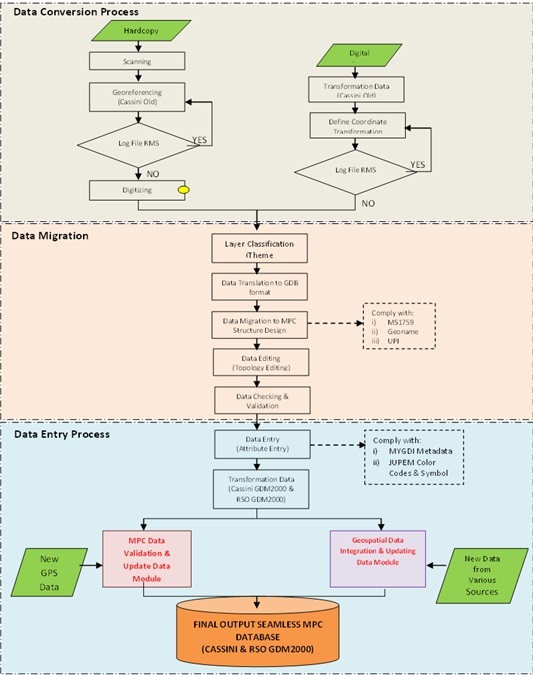 The Data Conversion, Data Entry and Data Migration process is described in Figure 6. 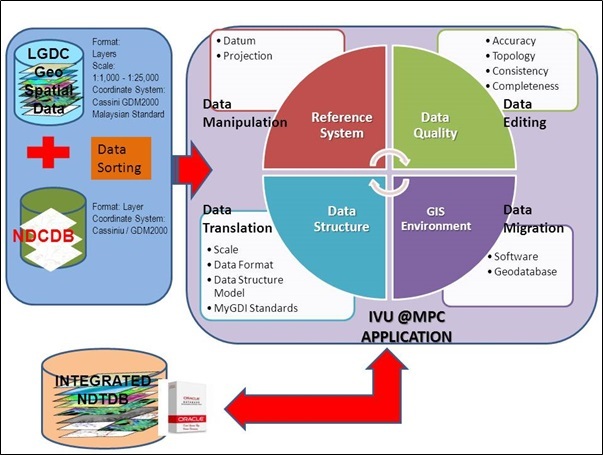 The integration of geospatial dataset and enhanced NDCDB can be divided into 4 main phases as visualize in Figure 7. Another component highlighted under the MPC Application module is Integration with street addresses. Street addressing is to assign an address using a system of maps and signs that give the numbers or names of streets and buildings. Geocoding of Street Address database is based on the enhanced NDCDB and building feature acquire during data acqusition process. Enhanced NDCDB consists of cadastral lot information, UPI and newly created Object Identification (OID). OID is created for building feature. Based on the street address database, geocoding process has been conducted systematically using cadastral lot number, UPI and OID. These information can be linked to zip, postal or situs method to generate street addreses based on integrated MPC GIS base map. Geocoding is the process of finding associated geographic coordinates (often expressed as latitude and longitude) from other geographic data, such as street addresses, or zip codes(postal codes). Geocoding is an important tool when it comes to geographic data accuracy. In order to geocode data, it must contain information about location such as a street address, a postal code (or at least part of it), or a name of an area, e.g.county, census subdivision, etc. Classification between ground points and above ground points. Feature class and feature dataset are carried out with overlay test. LoD4: the highest level, is achieved when building can be virtually visited and viewed from the inside. For this study, Level of Details 2 (LoD2) were used to depict 3D building in the housing estates in Putrajaya. Buildings in Precinct 14 Putrajaya housing estate, for example, were digitized conforming to LoD2 requirement. 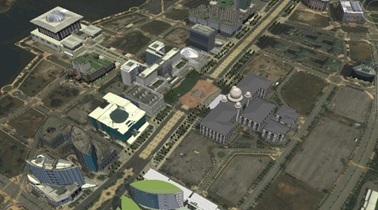 Level of Detail 3 (LoD3) were used to depict government buildings along the main boulevard in Putrajaya while LoD4 has been developed for the Putrajaya Central. The 3D City Model for FT Putrajaya was produced manually using Trimble Sketchup and then exported to ArcGIS Map. This was then integrated to database and set as a globe project in ArcGIS Server. This project could be recalled via a client PC through ArcGIS Explorer Desktop. The 3D City model visualization for FT Putrajaya integrates image textures for the rendering process. This process generates virtual reality of the real world. Sketch Up and ArcGIS Desktop Explorer software has been used to drape the related image to 3D city model. They were also subsequently used for Virtual Reality rendering and visualization of the 3D City model. The accuracy of 3D object depends on the 3D Terrestrial Point Clouds which is between 5cm to 2m. As for the 3D City Model, an Overlay Test were conducted on the orthophoto and fits nicely on the building foorprint and the Cadastral lots as shown in Figure 10. In order to conform with 95 % confidence level (1s), 30 verification points (Figure 11) must comply with the specified accuracy tolerance. 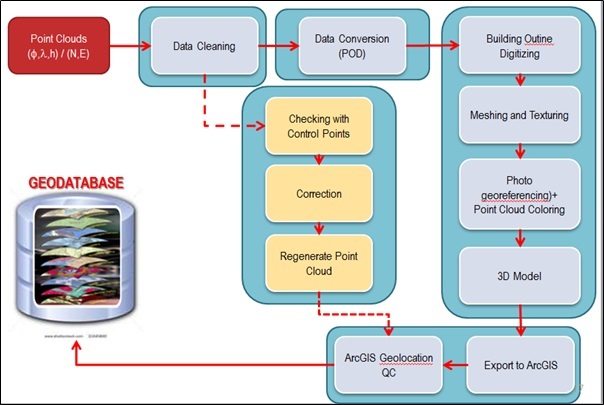 The verification point has been focussed to MPC Database that include all related dataset such as line map extracted from 3D Terrrestrial Point Cloud, enhanced NDCDB, LGDC Putrajaya, Utility and other related datasets. The accuracy achieved are acceptable and the MPC database developed can be optimised for planning purposes and other Cadastral Survey services purposes. 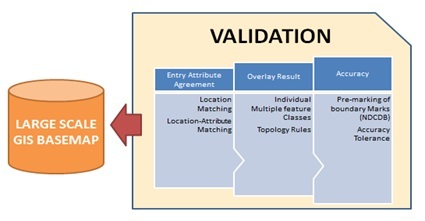 Based on the study conducted, it was agreed the following requirements are crucial in setting up a seamless and homogenous MPC database for Malaysia which are; Enhanced NDCDB as a base-map (shall be used as a reference layer in MPC database topology checking and validation); Comply with the Malaysian Standard for Feature and Attribute Coding Catalogue (MS1759); based on the SGDC theme layers; coordinate transformation are based on parameters endorsed by JUPEM; and objects to be model for 3D City model shall be at least on prominent buildings or landmark. 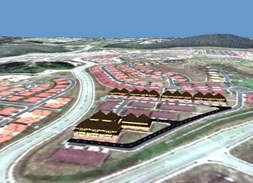 It was concluded that the FT Putrajaya MPC Database and its 3D city model have the potential to support spatially enable government, private sectors, and society in general, and to expand computer support in the process of visualization, organization and management of useful land information considering the high spatial accuracy achieved in this study. The accuracy of 3D MTLS features in the FT Putrajaya MPC Database can also be further improved with the use of a more sophisticated MTLS system. TENG Chee Hua is a Director of Cadastre Division at Department of Survey and Mapping Malaysia (JUPEM). He has been working with JUPEM in various capacities since 1980 and has interest and experience in cadastre, photogrammetry, geodesy and digital image processing. He is a fellow of Royal Institution of Surveyors Malaysia. Mohd Yunus MOHD YUSOFF is a Director of Licensed Surveyors Inspectorate Section at Department of Survey and Mapping Malaysia (JUPEM). He has been working with JUPEM in various capacities since 1985. He majors in GNSS and space geodesy. He is currently the elected Vice President of Malaysia Professional Centre and a member of Royal Institution of Surveyors Malaysia. Nur Zurairah ABDUL HALIM is an Assistant Director of Survey of Cadastral Division at Department of Survey and Mapping Malaysia (JUPEM). She is one of the Core Group that is responsible with most of Cadastral projects development, namely the eKadaster project and MPC pilot project, and has more than 10 years experience in handling project coordination and policies related to Cadastral Survey activities.